One of the most commonly asked questions travelers have when planning a trip to Machu Picchu is: when is the best time to go? There are a couple of key considerations to keep in mind, namely weather and crowds. It’s difficult to avoid crowds altogether, since the site is so popular, but certain times of year will definitely be less crowded than others. The Machu Picchu rainy season is between November and April. Tours to Machu Picchu are still common during this time. Though January and February are ill-advised due to heavy rains which often cause mudslides and other dangerous hiking conditions. One caveat to visiting during this time is that the cloud cover is heavy, and usually don’t clear at Machu Picchu until around 9am. So if you do reach the site early, there’s a chance you won’t see the sunrise. The average daily temperature during the rainy season is 18 °C (64 °F). The Inca Trail is closed during February for maintenance, although Machu Picchu remains open. You can visit via the challenging Salkantay Trek or by one of the trains from Cusco. The dry season in Machu Picchu is considered to be between April and September. This is when tours along the trails and on the rails will be the most crowded. It’s generally sunny throughout the day, with an average daily temperature 18 °C (64 °F), with cold nights. The most popular times to visit are May through August. This coincides with summer in the Northern Hemisphere which also means the crowds are at their heaviest. January is the second highest month for rainfall in Machu Picchu. This is one of the least popular months to travel to Machu Picchu because of the weather, but if avoiding crowds is the most important aspect of your trip this could be a good option. Bring some heavy duty rain gear! 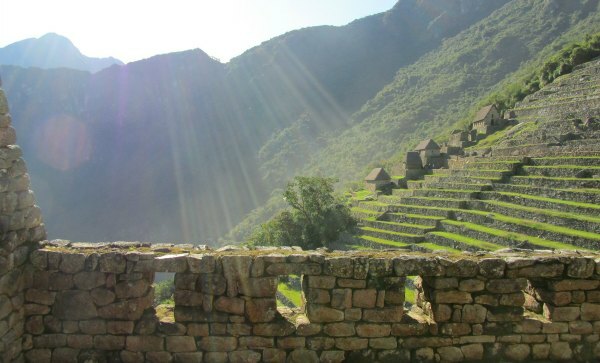 The average high on the Inca Trail in January is 68 degrees F, while the average low is 45. While Machu Picchu is open in February, be forewarned that the Inca Trail is closed, both for maintenance and safety reasons. This month receives the highest rainfall on average, and this can cause very slippery and muddy trails. Late March and early April are going to be the best times to visit Machu Picchu to avoid the peak crowds. It will most likely be drizzly and foggy, so be prepared for wet hiking and potentially obstructed visibility at the site. April is one of the best months to visit Machu Picchu. The crowds are not extreme yet, and the weather will be near perfect. You may experience slightly more rain then the following three months (May, June, July), but April is entering the dry season. The average high along the Inca Trail in April is 72 degrees F, and the low is 40. In May, Machu Picchu is beautiful and clear, but can be quite cold. Along the Inca Trail, the days will be pleasant at 70 degrees F, but night time will be chilly, with an average low of 36 degrees. With dry and cold weather comes dry skin and chapped lips, so pack accordingly! The month of June is one of the busiest times at Machu Picchu. During the middle of the summer for travelers from the northern hemisphere, you’ll run into bigger tour groups, lots of families and couples exploring the site. The temperature is much the same as May, with nights clocking in at a couple of degrees cooler. Average high on the Inca Trail in June is 70 degrees F and the low is 34. July is winter in Peru. Weather conditions are very similar to June, with highs in the mid 60s F. During these two months, Machu Picchu and the Inca Trail experience the coldest average temperatures in the evening hours. So if you’re planning on hiking, be sure to bring an extra insulation to wear, and a down sleeping bag for camping. In August, the weather in Machu Picchu and Cusco is predictably unpredictable. If you want to know what Machu Picchu is like throughout the year, visit in August, because you will most likely experience all seasons in one day! The average high along the Inca Tail is 70 degrees F, and the low is 34. September is the last month of the dry season in Machu Picchu. This is also another good month to visit for avoiding crowds. On average, September is the warmest month in Machu Picchu. The average high along the Inca Trail in September is 72 degrees F, and the low is 40 degrees. November begins the rainy season for Peru, but this is still a fine time to travel as the rains aren’t at their heaviest yet. Along the Inca Trail the average high is 73 degrees F in November, and 43 is the low. December is summer in Peru, so the weather will be between pleasant and hot. It’s also the middle of the rainy season, so expect consistently wet conditions. Humidity hovers The average temperature along the Inca Trail in December is 75 degrees F. At Machu Picchu in December, the temperature will be in the high 60s on average. December is probably the one exception for crowds during the rainy season. Savvy northern hemisphere travelers take advantage of their winter vacations for a trip down south for warmer weather. For peak comfortability, the best months to visit Machu Picchu are April or September. These months won’t be too hot, so as you’re chugging up steep hills in altitude, you’ll be refreshed occasionally by cool breezes and the sun won’t be blazing down constantly. They also don’t fall on typical vacation times for travelers, so crowds will be minimal. Once you’re at the site itself, the best way to see Machu Picchu is early in the day. Those staying in Aguas Calientes will have the option of catching the bus up to the ruins, which takes about 15 minutes. Lines begin to form around 4am, so get a good night’s sleep before! The busiest time of day at Machu Picchu is between 10am and 3pm. Visitors are welcome at the site until 5pm. People who are hiking along the Inca Trail actually have the benefit of getting to Machu Picchu before the crowds. However as noted above, several months out of the year, namely the rainy season months, there is the chance for significant cloud cover until 9am.